Embattled former IRS official Lois Lerner can breathe a small sigh of relief: as of now, the House has no plans to arrest her in an effort to compel her to testify about the agency's undue scrutiny of certain tax-exempt groups. 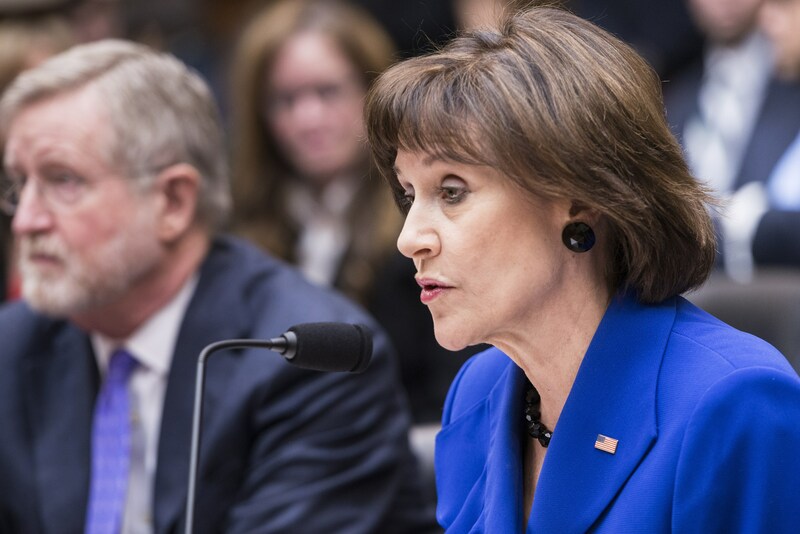 The House voted to hold Lerner in contempt of Congress last week for her repeated refusal to testify before the House Oversight and Government Reform Committee. The charge against her stems from an opening statement she made in a hearing last year declaring her innocence before invoking her Fifth Amendment right. Republicans say that by delivering her opening statement, she waived her rights against self-incrimination. Despite the contempt charge, Speaker John Boehner, R-Ohio, says it's up to Attorney General Eric Holder - not the House - to take the next steps. "The contempt charge has gone to the attorney general and its up to the attorney general, Eric Holder, to prosecute this and to assign someone to prosecute the case. Now will he do it? We don't know. But the ball is in his court," Boehner said over the weekend in an interview on Fox News' "Sunday Morning Futures." Boehner said a provision allowing the House to make its own arrest has "never been used and I'm not sure it's an appropriate way to go about this. It's up to Eric holder to do his job." Boehner spokesman Michael Steel clarified that the speaker was referring to the modern era, because the House did at one time enforce its own contempt findings. The Supreme Court has twice upheld the House's authority to arrest and even imprison people through a process called "inherent contempt." A 2014 report by the Congressional Research Service (CRS) found several instances in which Congress would dispatch the Sergeant-at-Arms to arrest the person being held in contempt. They would stand trial before the House, be given counsel, found guilty, and then penalized with arrest or a fine. "Inherent contempt has the distinction of not requiring the cooperation or assistance of either the executive or judicial branches. The House or Senate can, on its own, conduct summary proceedings and cite the offender for contempt," the report found. But the practice hasn't been used since 1935, in part because imprisonment for refusing to comply with a subpoena cannot extend past the current session of Congress, and also because the process has been described as "unseemly," cumbersome, time-consuming and ineffective in the modern era. Instead, Congress will usually rely on the executive branch to pursue criminal prosecution of a contempt citation, or the judicial branch to enforce a subpoena. As history has shown, though, even contempt citations from the full House don't always end in prosecution or a court order to testify. Lerner is one of just six people who have been held in contempt by the full House. Anne Gorsuch Burford, the head of the Environmental Protection Agency under former President Ronald Reagan, refused to turn over documents related to the agency's handling of the Superfund program to clean up hazardous waste sites. Burford claimed the documents were protected by executive privilege, and was held in contempt of Congress. Under fire, she resigned in 1983 but the administration eventually reversed course and released the documents to Congress. The outcome was different for Rita Lavelle, the woman who ran Superfund. The House voted unanimously to hold her in contempt after refusing to appear at a congressional subcommittee hearing. She was ultimately found not guilty of contempt in federal district court, but was later convicted of lying to Congress and sentenced to six months in prison and a $10,000 fine. Two other high-ranking officials, former White House Chief of Staff Joshua Bolten and former White House Counsel Harriet Miers, were held in contempt of Congress in February 2008 on a party-line vote for failing to cooperate with a congressional investigation into the firing of several federal prosecutors. The administration claimed executive privilege over the information sought by Congress. The Justice Department, however, did not bring criminal contempt charges against the two officials. The civil contempt charges were settled by the courts after former President George W. Bush had left office. That was the case for Attorney General Eric Holder after he was held in contempt of Congress for failing to provide documents relating to the Fast and Furious gunwalking program. One day after the vote, the White House said the Justice Department - which Holder leads - would not pursue criminal charges.